(Phys.org)—Paint these days is becoming much more than it used to be. Already researchers have developed photovoltaic paint, which can be used to make "paint-on solar cells" that capture the sun's energy and turn it into electricity. Now in a new study, researchers have created thermoelectric paint, which captures the waste heat from hot painted surfaces and converts it into electrical energy. "I expect that the thermoelectric painting technique can be applied to waste heat recovery from large-scale heat source surfaces, such as buildings, cars, and ship vessels," Jae Sung Son, a coauthor of the study and researcher at the Ulsan National Institute of Science and Technology (UNIST), told Phys.org. "For example, the temperature of a building's roof and walls increases to more than 50 °C in the summer," he said. "If we apply thermoelectric paint on the walls, we can convert huge amounts of waste heat into electrical energy." The thermoelectric paint looks very different than conventional thermoelectric materials, which are typically fabricated as flat, rigid chips. These devices are then attached to irregular-shaped objects that emit waste heat, such as engines, power plants, and refrigerators. However, the incomplete contact between these curved surfaces and the flat thermoelectric generators results in inevitable heat loss, decreasing the overall efficiency. In the new study published in Nature Communications, Sung Hoon Park et al., from UNIST, the Korea Institute of Science and Technology (KIST), and the Korea Electrotechnology Research Institute, have addressed this issue of incomplete contact by demonstrating that the thermoelectric paint easily adheres to the surface of virtually any shape. The thermoelectric paint contains the thermoelectric particles bismuth telluride (Bi2Te3), which are commonly used in conventional thermoelectric devices. The researchers also added molecular sintering aids which, upon heating, cause the thermoelectric particles to coalesce, increasing the density of these particles in the paint along with their energy conversion efficiency (the ZT values are up to 0.67 for n-type and 1.21 for p-type particles). 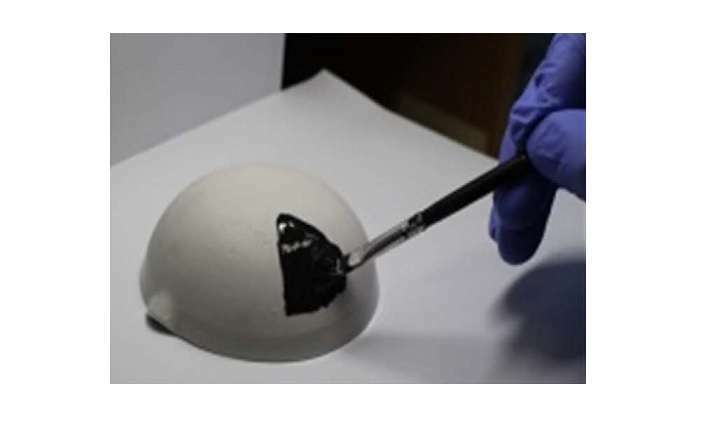 The researchers demonstrated that the thermoelectric paint can be painted onto a variety of curved heat-emitting surfaces. After sintering for 10 minutes at 450 °C, the painted layers form a uniform film about 50 micrometers thick. Tests showed that the devices painted with the thermoelectric paint exhibit a high output power density (4 mW/cm2 for in-plane type devices and 26.3 mW/cm2 for through-plane type devices). These values are competitive with conventional thermoelectric materials and better than all thermoelectric devices based on inks and pastes. Besides the traditional thermoelectric applications, the researchers expect that thermoelectric paint have the potential to be used as wearable thermoelectric energy harvesters. The technology developed here could also be used in 3D printed electronics and painted electronic art. The researchers plan to further pursue these applications in the future. 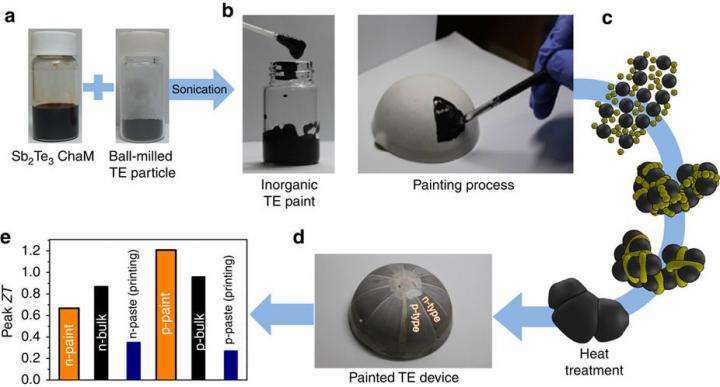 "We are planning on developing room-temperature-processable, air-insensitive, and scalable thermoelectric paint and painting processes for practical applications," Son said. How much is tellurium per ton and what is the delta T for the wattage specs reported? The hot and cold spots are not in the same area. The cold spot is on the other end of the wire. And solar heaters! I mean the solar hot water panel type that is used in a lot of roofs, that's ideal and it would allow it to double for both hot water and electricity.